Considering a dude ranch family vacation but not a fan of horseback riding? Choosing the right dude ranch vacation is key to enjoying the experience. My family spent a week at Red Horse Mountain Ranch in Idaho and I expected to ride each day, but on the third day, I realized that I was happier off the horse. I then panicked, wondering how I would spend my time, but it was the barn manager who convinced me I could give myself permission to enjoy my vacation and that didn’t have to include riding. He was right. There’s no doubt that the horseback riding program is a large part of any dude ranch experience, but at Red Horse Mountain Ranch you won’t feel excluded if you opt out. In the mornings, while most guests went on organized rides, I chose another activity like biking, indulged in a massage or simply relaxed. In the afternoons, there were riding options if the weather wasn’t too hot and small group activities that I did with my family. It was one of the best vacations we’ve had: unplugged and focused on our family and meeting new friends. The ranch has a handful of activities that are always available, including fishing, basketball, a grassy area for badminton and balls, board games and the pool. Other activities rotate through the weekly schedule and guests sign up for what interests them. We never felt that we needed to rush to put our names on a list, as the excellent staff accommodated requests when possible. Want help planning a dude ranch vacation? One of the first group activities of the week is a jeep ride to the ranch’s onsite rock wall, zipline and high wire “playground.” There’s no pressure to try all of them, and there are shade and water for spectators. This is a great beginning activity for guests get to know each other as they cheer on the climbers and shout encouragement to those who take a “leap of faith” by jumping off the platform, reaching for the acrobat bar. For most kids and many adults at the ranch, archery and riflery are new activities. These are organized in small groups, require a parent to participate and are highly supervised with age restrictions. A little competitiveness takes over, especially in archery, as all the kids are trying to hit the various “animal” targets at the stations scattered in the woods — including a dinosaur that moves along a wire. The staff stress safety and proper etiquette for both active participants and those waiting. Red Horse Mountain Ranch takes advantage of the close proximity to Lake Coeur d’Alene with early morning fishing trips, bike rides around the lake, a very popular kayak trip with swimming, and the challenging Jetovator experience (for an additional fee). The latter is recommended for teens and up; my 10-year-old had much more difficulty than my teenager. However, the water temperature was so agreeable we were happy to spend time watching the others. Get your Western gear and head to the saloon! Western-themed entertainment after dinner is mixed in throughout the week. One night includes Western dancing; on another night, guests visit the “saloon” for lassoing, pool, table tennis and karaoke. The activities are near the stables, so kids often stop by to see how their horse is doing and maybe give them a treat from the kitchen. One of the most fun activities of the week for all ages is the Mega Zip, which zooms over the field and ends with a splash in pond. It’s a perfect ending to an activity-filled week. 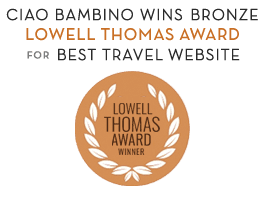 Editor’s Note: Ciao Bambino received a media package to review Red Horse Mountain Ranch for families. As always, our opinions are our own. Photos by Kristi Marcelle.